Last week Hamas terrorists stood on principle. They turned away 2 Israeli trucks of medical supplies, including IV fluids, bandages, pediatric equipment, disinfectants and fuel for hospital generators. This despite the fact that hospitals in Gaza are suffering from shortages. But Hamas did not turn everything away. They did accept 4 shipments from the Palestinian Authority and 2 from UNICEF. So what was Hamas trying to prove? Keep in mind that whatever point they are trying to make, Hamas is not above making that point at the expense of their own people. In fact, despite the economic situation in Gaza, in 2014 Forbes Israel ranked Hamas as one of the 10 wealthiest terror organizations -- ahead of Hezbollah, Al-Qaida and Taliban, and second only to ISIS. So when Hamas turns back medical essentials at a time that hospitals in Gaza don't have enough of the supplies it needs, it is unlikely Hamas expects to suffer the natural consequences of their actions. After all, we are talking about the same terrorists who have no problem using their people as human shields. In fact, we know that Hamas has no problem affording themselves the best medical treatment in the region - from Israel. 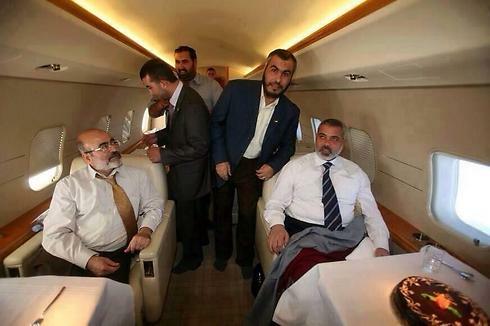 o April 2012: Haniyeh's brother-in-law was treated in Israel for a serious cardiac episode that could not be treated in Gaza. According to Al Arabiya, Haniyeh's brother-in-law and his wife "had the option of going to a more advanced medical center in Egypt but chose to go to the Israeli hospital instead." Haniyeh did not stand in their way. o November 2013: Haniyeh's granddaughter was admitted Schneider Children’s Medical Center for Israel in Petah Tikva in serious condition for acute infection of the digestive tract. o October 2014: One of Haniyeh's daughters was admitted to an Israeli hospital for emergency medical treatment after she suffered complications from a routine procedure. Actually, Hamas does generally allow regular Gazans into Israel for medical treatment. According to Israel's Coordinator of Government Activities in the Territories (COGAT), which coordinates with Palestinian authorities on border crossings, about 20,000 Gazans enter Israel per month, mainly for medical treatment. Hamas treads a fine line, making a show of rejecting Israeli aid. But the fact is that as things stand now, Hamas leaders are as much in need of Israel and the help it provides as the people of Gaza are.